A fantastic ultraportable laptop with an excellent battery life. 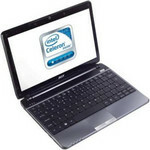 Acer's Aspire laptops represent the company's consumer range, and the Aspire 1410-74G25n is a CULV (Consumer Ultra Low Voltage) laptop that offers fantastic value for money. The Acer Aspire 1410-74G25n sets a very high bar for the other laptops on test, and the excellent battery life will be a clincher for many buyers. If you're after power, however, we suggest you check out the Lenovo G550.